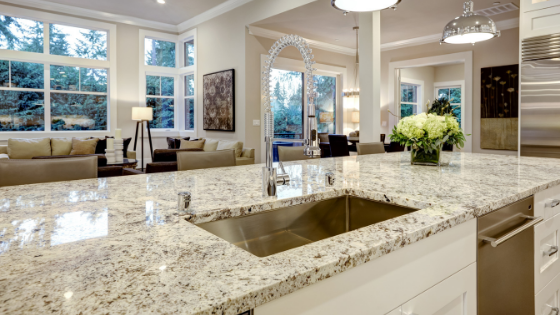 Granite countertops are a uniquely beautiful style—but do you know the other advantages of this natural stone? Turns out, granite is more than just a pretty countertop. It’s durable, easily cleaned and repaired, and each piece is unique. If you’re considering this stone to decorate your kitchen or bathroom with, there are many good reasons to go granite. Though they are a more expensive stone, it’s for good reason. If you’re looking for a stone that will last the lifetime of your house and leave you stunned when you look at it—consider granite. Granite is a very durable material that tends to last longer than most other countertop materials. When granite countertops are sealed regularly and cared for properly, they can last the lifetime of your house. You’ll be hard pressed to find a more durable material than this natural stone. Granite is very difficult to scratch. While it’s true, you can cut on granite countertops without scratching them—it is not recommended that you do this. It is rare, but it can still scratch your countertop, and in any case, it is very hard on your knives. It will likely lead to quickly dulled knives. Because granite is made up of interlocking mineral crystals, each piece of granite is unique. Granite comes in different colors and shade, depending on which mineral is more prominent. Every slab cut has a unique color and pattern that cannot be replicated. The classic style of granite is often white, gray, and black with veins across the slab to create a unique stone. As stated previously, it is not easy to scratch or chip your granite—but if it does happen, it can be fixed! Polish and sealant may do the trick if your scratch and chip are small enough. Filling the area with sealant and rubbing it away will take care of small scratches. For a large chip or scratch, there are many DIY fixes out there—some including super glue and other including putty. No matter the method you go with, you will be able to restore your granite countertop to looking like new in no time. In the case of a large scratch or chip, you can contact a professional for some help restoring your countertop to its former glory. The sealant on the surface of granite countertops makes it non-porous. When a material is non-porous it is much less likely to absorb things such as dirt, bacteria, stains, etc. This non-porous material makes it difficult for stains to set in and dirt to invade. Because unwanted spills cannot sink in, they are easily cleaned off of granite, leaving it good as new. You can easily keep your granite countertops looking and feeling clean, free of stains and germs. Be wary of lemon juice or other acidic liquids that can wear down the sealant of your countertop and leave it more vulnerable to stains and bacteria.